By Keith R. Long, Bradley S. Van Gosen, Nora K. Foley, and Daniel Cordier. 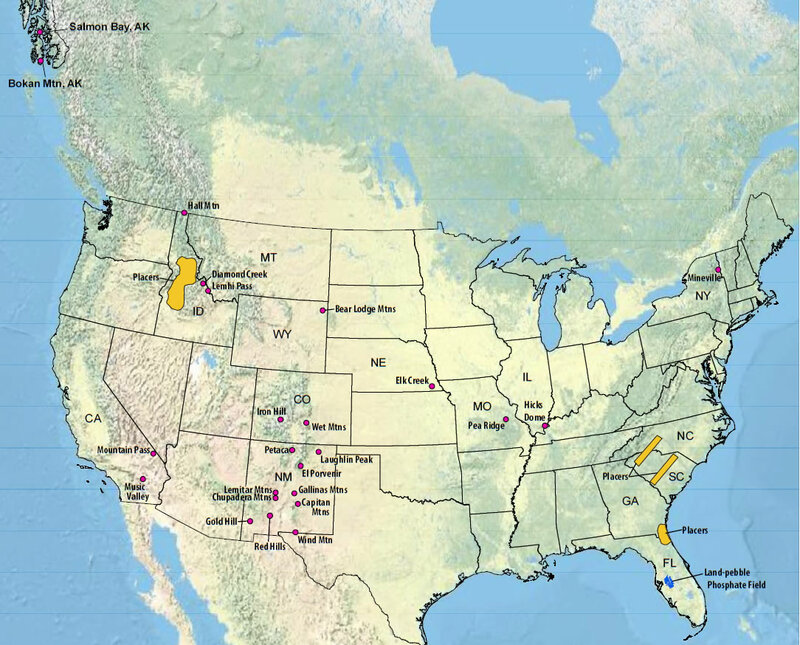 Rare earth element map: Rare earth element districts in the United States are mainly located in the west. This map shows the location of potential production locations - enlarge map to see all of the locations. Rare Earth Elements Are Not "Rare"
Several geologic aspects of the natural occurrence of rare earth elements strongly influence the supply of rare-earth-elements raw materials. These geologic factors are presented as statements of facts followed by a detailed discussion. Although rare earth elements are relatively abundant in the Earth's crust, they are rarely concentrated into mineable ore deposits. The estimated average concentration of the rare earth elements in the Earth's crust, which ranges from around 150 to 220 parts per million (table 1), exceeds that of many other metals that are mined on an industrial scale, such as copper (55 parts per million) and zinc (70 parts per million). Unlike most commercially mined base and precious metals, however, rare earth elements are rarely concentrated into mineable ore deposits. The principal concentrations of rare earth elements are associated with uncommon varieties of igneous rocks, namely alkaline rocks and carbonatites. Potentially useful concentrations of REE-bearing minerals are also found in placer deposits, residual deposits formed from deep weathering of igneous rocks, pegmatites, iron-oxide copper-gold deposits, and marine phosphates (Table 2). Alkaline igneous rocks form from cooling of magmas derived by small degrees of partial melting of rocks in the Earth's mantle. The formation of alkaline rocks is complex and not fully understood but can be thought of as a geologic process that extracts and concentrates those elements that do not fit into the structure of the common rock-forming minerals. The resulting alkaline magmas are rare and unusually enriched in elements such as zirconium, niobium, strontium, barium, lithium, and the rare earth elements. When these magmas ascend into the Earth's crust, their chemical composition undergoes further changes in response to variations in pressure, temperature, and composition of surrounding rocks. The result is an astonishing diversity of rock types that are variably enriched in economic elements, including the rare earth elements. The mineral deposits associated with these rocks are likewise quite diverse and awkward to classify, in that the distinctive features of these deposits and their rarity can result in classifications that have only one or a few known examples. Rare earth element geologic map: Generalized geologic map of most of the Mountain Pass rare earth element district, southern California. 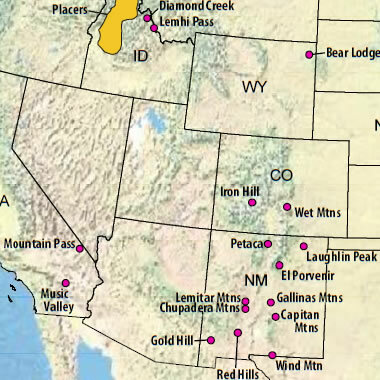 Only a representative minority of the hundreds of shonkinite, syenite, and carbonatite dikes are shown. Widespread andesitic and rhyolitic dikes, of Mesozoic or Tertiary age, are not shown. From USGS Open-File Report 2005-1219. Enlarge map. Classification of ores related to alkaline rocks is also controversial. Table 2 presents a relatively simple classification that follows analogous categories for deposits related to nonalkaline igneous rocks. Some of the more unusual alkaline rocks that host, or are related to, REE ores are carbonatite and phoscorite, igneous rocks composed principally of carbonate and phosphate minerals, respectively. Carbonatites, and especially phoscorites, are relatively uncommon, as there are only 527 known carbonatites in the world (Woolley and Kjarsgaard, 2008). Economic concentrations of REE-bearing minerals occur in some alkaline rocks, skarns and carbonate-replacement deposits associated with alkaline intrusions, veins and dikes cutting alkaline igneous complexes and surrounding rocks, and soils and other weathering products of alkaline rocks. REE Periodic Table: The Rare Earth Elements are the 15 lanthanide series elements, plus yttrium. Scandium is found in most rare earth element deposits and is sometimes classified as a rare earth element. Image by Geology.com. Weathering of all types of rocks yields sediments that are deposited in a wide variety of environments, such as streams and rivers, shorelines, alluvial fans, and deltas. The process of erosion concentrates denser minerals, most notably gold, into deposits known as placers. Depending on the source of the erosion products, certain rare earth elements-bearing minerals, such as monazite and xenotime, can be concentrated along with other heavy minerals. The source need not be an alkaline igneous rock or a related rare-earth deposit. Many common igneous, metamorphic, and even older sedimentary rocks contain enough monazite to produce a monazite-bearing placer. As a result, monazite is almost always found in any placer deposit. However, the types of placers with the greatest concentrations of monazite are typically ilmenite-heavy mineral placers, which have been mined for titanium oxide pigments, and cassiterite placers, which are mined for tin. Iron Hill rare earth deposit: Northwest-facing view of Iron Hill, Gunnison County, Colorado. 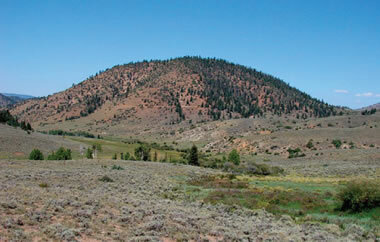 Iron Hill is formed by a massive carbonatite stock that forms the center of an alkaline intrusive complex. This complex hosts many mineral resources, including titanium, niobium, rare earth elements, and thorium. USGS Image. In tropical environments, rocks are deeply weathered to form a unique soil profile consisting of laterite, an iron- and aluminum-rich soil, as much as many tens of meters thick. The processes of soil formation commonly concentrate heavy minerals as residual deposits, resulting in an enriched-metal layer over the underlying, unweathered bedrock. When a rare-earth deposit undergoes such weathering, it may be enriched in rare earth elements in concentrations of economic interest. A particular type of REE deposit, the ion-absorption type, is formed by the leaching of rare earth elements from seemingly common igneous rocks and fixing the elements onto clays in soil. These deposits are only known in southern China and Kazakhstan and their formation is poorly understood. Among pegmatites, a group of very coarse grained intrusive igneous rocks, the niobium-yttrium-fluorine family, comprises a large number of subtypes formed in different geologic environments. These subtypes are granitic in composition and are usually found peripheral to large granitic intrusions. In general, however, rare earth elements-bearing pegmatites are generally small and are of economic interest only to mineral collectors. The iron-oxide copper-gold type of deposit has been recognized as a distinct deposit type only since the discovery of the giant Olympic Dam deposit in South Australia in the 1980s. The Olympic Dam deposit is unusual in that it contains large amounts of rare earth elements and uranium. An economic method for recovering rare earth elements from these deposits has not yet been found. Many other deposits of this type have been identified around the world, but information on their rare earth elements content is generally lacking. Trace amounts of rare earth elements have also been identified in magnetite-apatite replacement deposits. Karst bauxites, aluminum-rich soils that accumulate in cavernous limestone (underlying karst topography) in Montenegro and elsewhere, are enriched in rare earth elements, but the resulting concentrations are not of economic interest (Maksimovic and Pantó, 1996). The same can be said for marine phosphate deposits, which can contain as many as 0.1 percent REE oxides (Altschuler and others, 1966). As a result, recovery of rare earth elements as a byproduct of phosphate fertilizer manufacture has been investigated. The ores of rare earth elements are mineralogically and chemically complex and commonly radioactive. In many base and precious metal deposits, the metals extracted are highly concentrated in a single mineral phase, such as copper in chalcopyrite (CuFeS2) or zinc in sphalerite (ZnS). Separation of a single mineral phase from rock is a relatively easy task. The final product is a concentrate typically sent to a smelter for final extraction and refining of the metals. Zinc, for example, is almost entirely derived from the mineral sphalerite, such that the global zinc smelting and refining industry has developed a highly specialized treatment of this mineral. Thus, production of zinc has a pronounced cost advantage in that a single standard technology is used, and the development of a new zinc mine is a largely conventional process. Current mineral-processing practice is capable of sequential separation of multiple mineral phases but it is not always cost effective to do so. When elements of interest are found in two or more mineral phases, each requiring a different extraction technology, mineral processing is relatively costly. Many rare earth elements deposits contain two or more rare earth elements-bearing phases. Therefore, rare earth elements deposits in which the rare earth elements are largely concentrated in a single mineral phase have a competitive advantage. To date, REE production has largely come from single-mineral-phase deposits, such as Bayan Obo (bastnasite), Mountain Pass (bastnasite), and heavy-mineral placers (monazite). Rare earth elements-bearing minerals, once separated, contain as many as 14 individual rare earth elements (lanthanides and yttrium) that must be further separated and refined. The complexity of extracting and refining rare earth elements is illustrated by a metallurgical flow sheet for the Mountain Pass mine in California (fig. 2). Unlike metal sulfides, which are chemically simple compounds, REE-bearing minerals are quite complex. Base metal sulfide ores, such as sphalerite (ZnS), are typically smelted to burn off sulfur and separate impurities from the molten metal. The resulting metal is further refined to near purity by electrolysis. Rare earth elements, on the other hand, are typically extracted and refined through dozens of chemical processes to separate the different rare earth elements and remove impurities. The principal deleterious impurity in REE-bearing minerals is thorium, which imparts an unwanted radioactivity to the ores. Because radioactive materials are difficult to mine and handle safely, they are heavily regulated. When a radioactive waste product is produced, special disposal methods must be used. The cost of handling and disposing of radioactive material is a serious impediment to the economic extraction of the more radioactive REE-rich minerals, in particular monazite, which typically contains considerable amounts of thorium. In fact, imposition of tighter regulations on the use of radioactive minerals drove many sources of monazite out of the rare earth elements market during the 1980s.